Panasonic has reached a basic agreement with Tesla Motors to participate in the Gigafactory, the huge battery plant that the American electric vehicle manufacturer plans to build in the U.S.
Tesla aims to begin the first phase of construction this fiscal year. The plant would start making lithium-ion cells for Tesla cars in 2017. The automaker is shouldering the cost for the land and buildings. Panasonic likely will invest 20 billion to 30 billion yen ($194-291 million) initially, taking responsibility for equipping the factory with the machinery to make the battery cells. An official announcement on the partnership will come by the end of this month. Capacity at the Gigafactory will be added in stages to match demand, with the goal of producing enough battery cells in 2020 to equip 500,000 electric vehicles a year. The total investment is expected to reach up to $5 billion, and Panasonic's share could reach $1 billion. 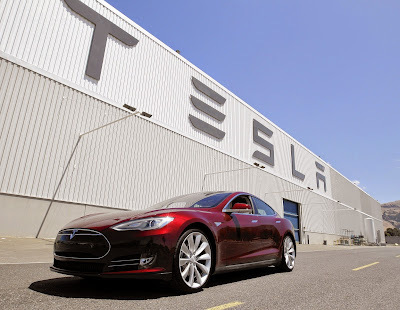 The Japanese company owns a stake in Tesla and currently makes the batteries for Tesla cars. In a contract reworked in October 2013, the two agreed that Panasonic would supply Tesla with 2 billion battery cells between 2014 and 2017.